For a long time, development of alloys was restricted to one principal element, or rarely two, with minor elements added for properties and performance optimization. In 2004, an equimolar Co, Cr, Fe Mn and Ni alloy was produced and was unexpectedly found to be single-phase. A new concept of materials was born: multi-component alloys forming a solid-solution and in which all components are very concentrated. By definition this new material concept should make it possible to explore an almost infinite field of chemical compositions. But in the meantime, the thermodynamic stability of these systems is very poorly known and severely limits the choice of alloy compositions. In this context, the first objective of this study is to fully determine the composition range of existence of a unique face-centered cubic (fcc) solid solution within the multi-component Co-Cr-Fe-Mn-Ni system. To address this problem, the phase stability was theoretically and experimentally investigated. Using the Calphad approach and a new database (TCHEA1), the stable phases of 10 626 compositions could be calculated, depending on the temperature. Eleven alloys were also processed and characterized by XRD, SEM-EDS and EBSD. 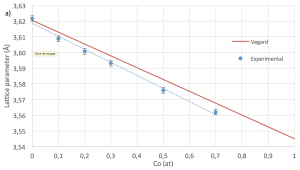 The comparison between calculation and experimental results indicates that the fcc solid solution is accurately described by the TCHEA1 database but the σ phase is more stable than predicted by calculation. It was shown that the fcc phase is stable over a wide range of composition, which was completely described. Now, it is possible to choose a priori a composition which will form a solid solution within the Co-Cr-Fe-Mn-Ni system. Moreover, the heat of mixing of the fcc phase were calculated for the ten binary and ten ternary systems with Density Functional Theory (DFT). This method coupled with Calphad calculations allows to improve the description of this system. Finally, this work provided an important opportunity to improve the understanding of the “high entropy system” Co-Cr-Fe-Mn-Ni. We have shown that the fcc phase is stable over a wide range of compositions at high temperature, which is very promising for multi-properties optimization. Moreover, from a mechanical point of view, this new alloy concept is expected to exhibit unprecedented mechanical properties. Indeed high entropy alloys can combine high mechanical resistance and large ductility. However, the influence of the composition on the fcc solid solution strengthening is not fully understood, which limits mechanical optimization. Furthermore, the transition between high entropy alloys and conventional alloys is not clearly defined . In this context, the evolution of structural and mechanical properties of multi-components alloys is experimentally investigated. Several alloys from the Co-Cr-Fe-Mn-Ni system forming a unique fcc solid solution were processed. The lattice parameter was measured by X-ray diffraction while the hardness and elastic modulus were measured by nanoindentation. In the future, the role of each element on mechanical behaviour will be analysed. Figure 1. 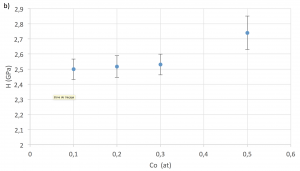 Isopleth section of cobalt calculated with the Calphad method and the TCHEA1 database. The black dashed line represents the equimolar composition. The red circles indicate the processed alloys of this study and the corresponding characterizations by Electron BackScattered Diffraction and X-Ray diffraction. 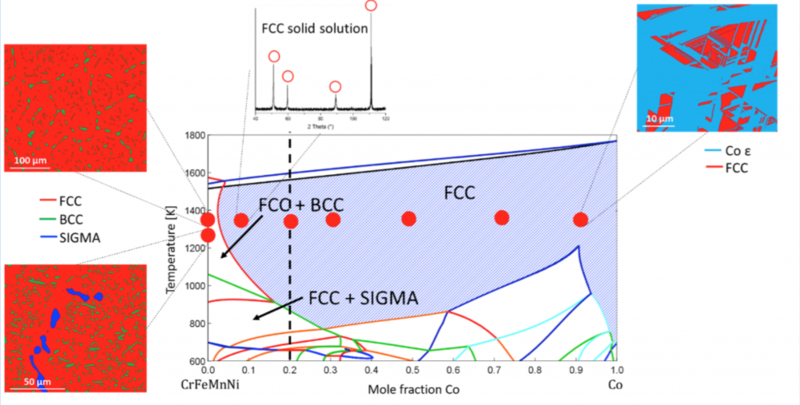 Bracq, G., M. Laurent-Brocq, L. Perrière, R. Pirès, J.-M. Joubert, and I. Guillot, The fcc solid solution stability in the Co-Cr-Fe-Mn-Ni multi-component system. Acta Materialia, 2017. 128: p. 327-336.